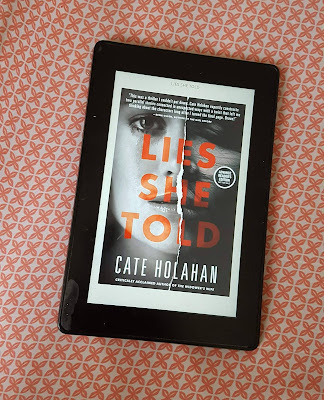 Today I have a review of Lies She Told by Cate Holahan, a fantastic psychological thriller and a selection for September's Book of the Month Club! 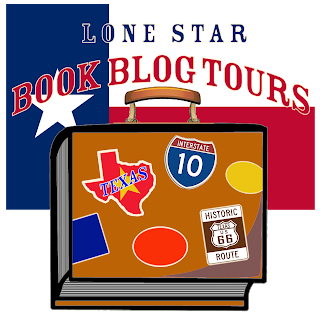 She graciously provided a guest post to discuss how she creates her characters. "Sometimes the truth is darker than fiction." Cate Holahan is the USA Today bestselling author of The Widower's Wife and Dark Turns, all published by Crooked Lane Books. The Widower's Wife was named to Kirkus' best books of 2016. 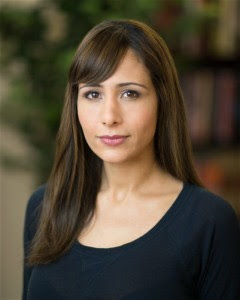 An award-winning journalist and former television producer, she has written for BusinessWeek, The Boston Globe, and The Record newspaper. Her short fiction won first place in the 19th annual Calliope competition, a magazine published by the writer's group of American Mensa. She lives in New Jersey with her husband, two daughters, ages 7 and 5, and dog Westley. My husband is not David Jacobson. Probably, he would have preferred that I’d included such a disclaimer in the first pages of my new book, Lies She Told, instead of my current dedication to him. He assumes readers will believe that he’s the mercurial and dishonest spouse of my protagonist, Liza. Write what you know, after all, is the adage. So, why wouldn’t readers surmise that I wrote a story about who I know? The truth is, I don’t lift my plots or characters from my real life. My suburban mom/writer/wife existence—much of which centers around my kids and my laptop—isn’t thriller fodder. But I do abstract from what I know and, even more, from what I learn. How I do this is not completely within my control. Images and articles stick in my subconscious for reasons not always understood by me, drawing my attention to certain ideas. These thoughts crash together in my brain, elements colliding and bonding to form new, weightier ideas. Ultimately, as the dust swirls, I begin to see a story. For me, this nascent novel often takes the form of a theme that I would like to explore compounded with a what if question. In Lies She Told the theme is artistic inspiration—where do ideas come from. The question is: what if a writer saw strange parallels in her work-in-progress novel and a mystery in her real life? Once I have this beginning, I begin to formulate my main character. Who would be the writer in my story? Not me, certainly. I’m not sufficiently objective with regard to my own failings to put myself on the page. And, as mentioned before, my day-to-day life isn’t that interesting. But I can and do put parts of me into my protagonists. In Lies She Told, I gave Liza some of my creative process and work ethic. In my prior book, The Widower’s Wife, I gave the main character, Ana, some of my momma-bear protectiveness. However, to make Liza and any of my characters worthy of a novel, I have to invent far more compelling back stories than my own capable of pushing the characters to behave in riveting ways. These back stories require research. 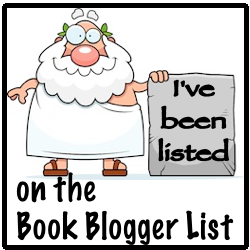 I read other novels, consume various profiles of famous (and infamous) people, peruse psychology books. I think of traits that I admire in people I love and dislike in those I try to avoid, and I muse about what histories might give rise to such characteristics. After all this research, I have a good sense of who my story involves. Then, I change my what if question. For Lies She Told, the new one became: what if writer Liza Cole saw strange parallels in her work-in progress novel that relate to the disappearance of her husband’s business partner? This new puzzle brought me to plotting. I thought of Liza in various scenes that, put together, enabled her to arrive at an answer. In Excel, I mapped out the dramatic situations Liza would find herself in and how her actions would lead to the next scene. I also tracked Liza’s character arc, trying to figure out how she would change during the course of the story from what she learns and how that growth would alter her actions—and, therefore, my initial plot. With all my plotting done, I wrote my first draft (much of which I ended up tossing). For me, the draft is part of the process. It solidifies my protagonist’s personality as well as those of my supporting characters, and it often forces me to go back and re-plot so that the story evolves naturally from the people that I’ve created. By the time I turn in a book, the characters and story are truly made up. Though, to me, they feel real. And I believe they will feel that way to readers. But they won’t be based on my husband. This book within a book follows Liza, a romantic suspense author who is quickly approaching the deadline for a rough draft of her latest novel and Beth, the female protagonist of the story Liza is trying to craft. Each chapter alternates between Liza's current personal life and chapters of the novel. Fact and fiction are truly blurred as many of the elements from Liza's novel become mirrored in her own life, making her an even more unreliable narrator than her own character! Each of these women's stories was engaging and suspenseful, so reading these two perspectives was like reading two thrillers in one! Liza's narrative and her crime novel are separate, standalone stories, but they complement one other perfectly as each unfolds. The psychological suspense added so many layers to the mysteries going on in each story, while the subtle blending of real and not real elements is still making me question the "truth" that was actually presented. I had never read any of Holahan's previous books, but they are now added to my TBR and I can't wait to get started on them! And how about a shout out for the cover design, which instantly drew me into wanting to read the book when I saw it and actually works really well in capturing the essence of the story now that I've read it, which doesn't happen a lot. This book is fast-paced, thought provoking, and highly recommended! 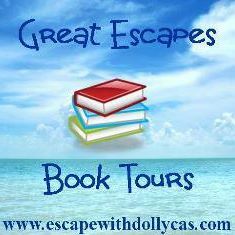 Many thanks to NetGalley, Great Escapes Book Tours, Crooked Lane Books, and especially Cate Holahan! It was a pleasure providing a review. I liked the review, sounds like a fabulous read. Enjoyed the description of "Lies She Told". Sounds like a great read.